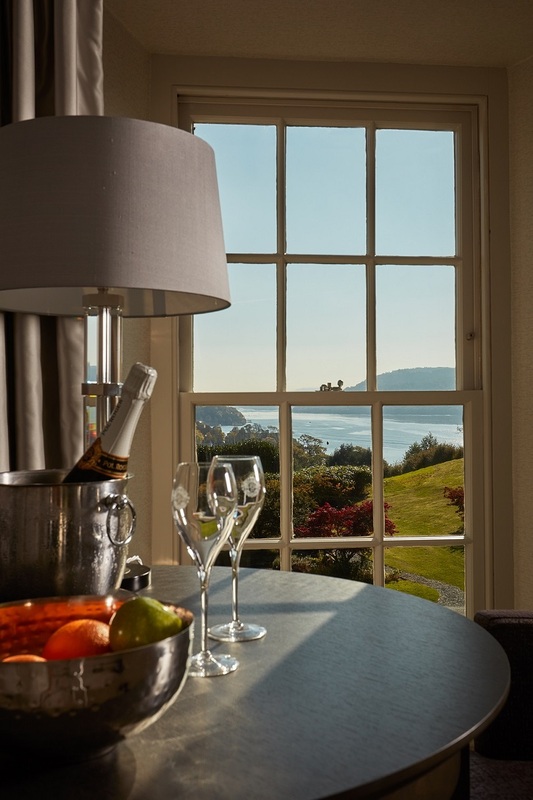 Every consideration for your comfort and relaxation has been lavished on The Samling. 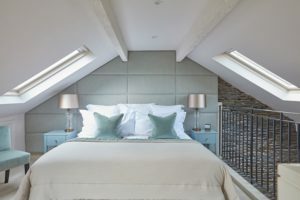 A striking gabled Georgian house, surrounded by a cluster of old lakeland stone buildings, the décor complements both the original interior and the contemporary conversion of the vernacular buildings. 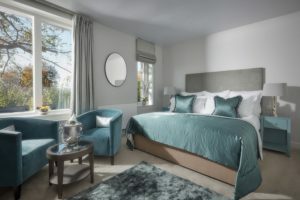 A backdrop of stone shaded neutrals enhances accents of rich colours drawn from the surrounding landscape – the deep indigo blues and greens of the tree fringed lake, to flashes of vivid gold lichen. 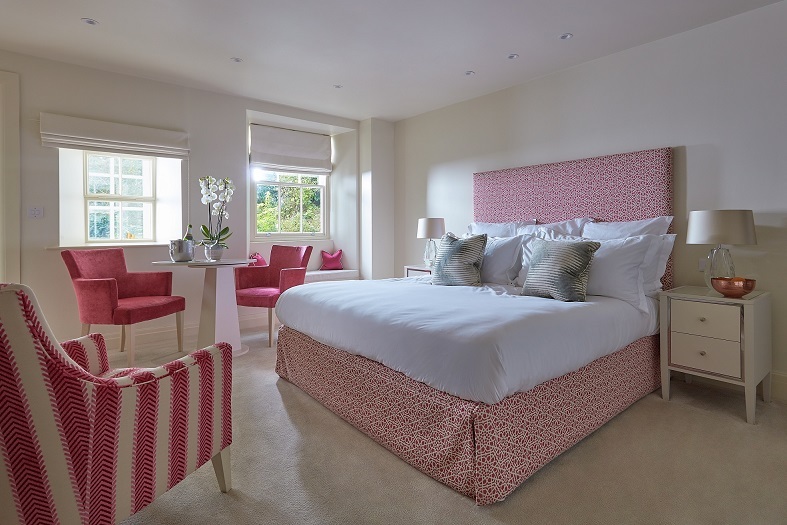 Every room has its individual character but all cosset you with sumptuous yielding comfort and elegant luxury. 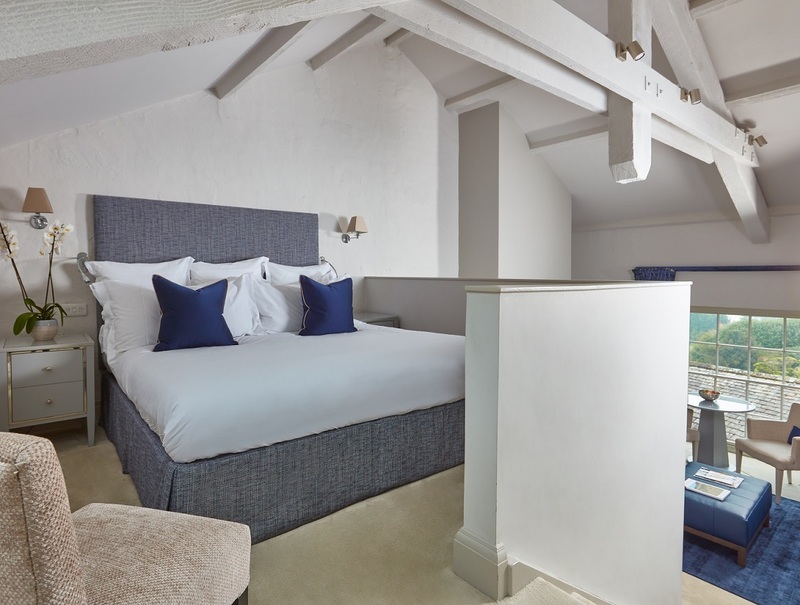 Most rooms enjoy our elevated lake views South and West, only two do not, overlooking the gardens and woodland behind us instead. 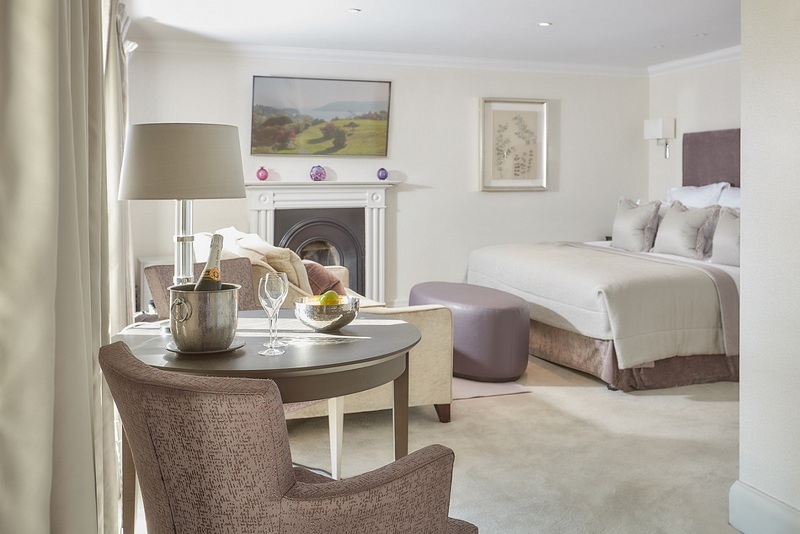 The Main House accommodates 5 bedrooms: The Classic Double Frozen Fell; Luxury Doubles, Rydal Water, Grasmere, and Thirlmere; and the Junior Suite, Coniston. 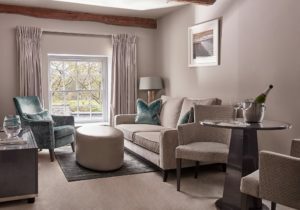 To the left of the Main House, facing out over the lake and original water garden is the first of the converted outbuildings – housing the Classic Double Buttermere; and the Suite Blea Tarn, with its private patio. 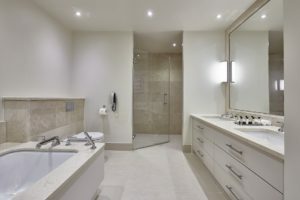 These rooms are self-contained and can be used as an interconnecting 2 bedroom suite. 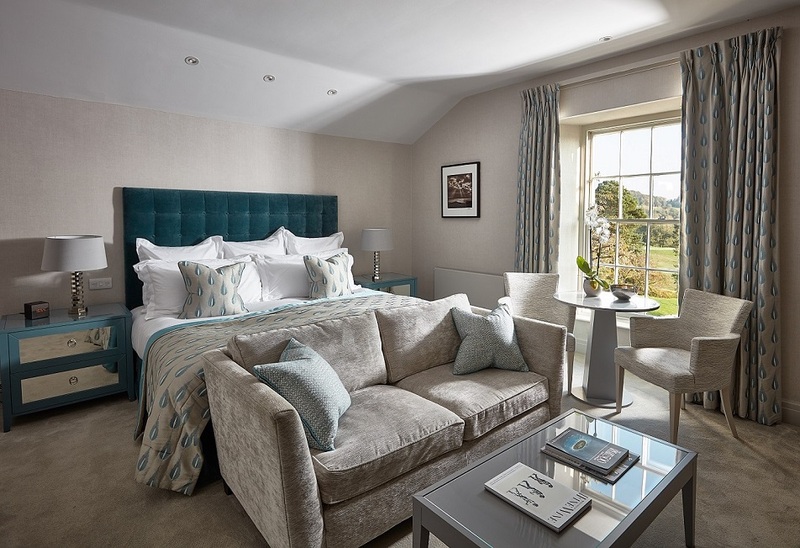 Immediately behind, but raised into the slope of the fell so they enjoy unimpeded lake views are the Suites Loweswater, Elterwater, Kentmere, and Windermere. 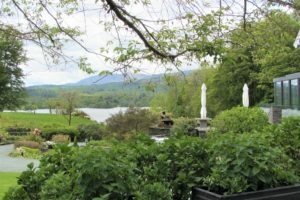 Nestled in the corner of these buildings, facing onto the national Trust woodland, is the Classic Double room, Derwent Water. 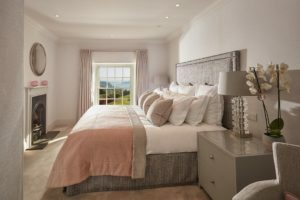 We welcome children to The Samling over 8 years of age, we are able to provide z-beds in some rooms with a supplement of £50 B&B per night. 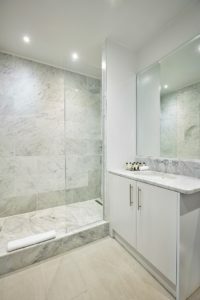 Please enquire about availability at the time of booking. 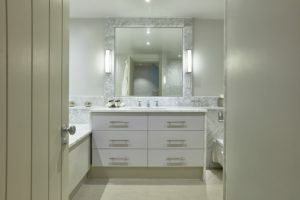 We have 1 pet friendly Suite. Set over three floors, starting with a marble clad bathroom featuring a generous bath and separate walk-in shower. 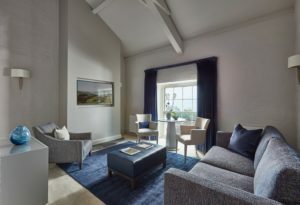 A short flight of stairs lead to the sitting room flooded with light from its large view filled window facing out over Windermere; the rooms are decorated in soft neutrals and the rich navy blues of the evening sky. 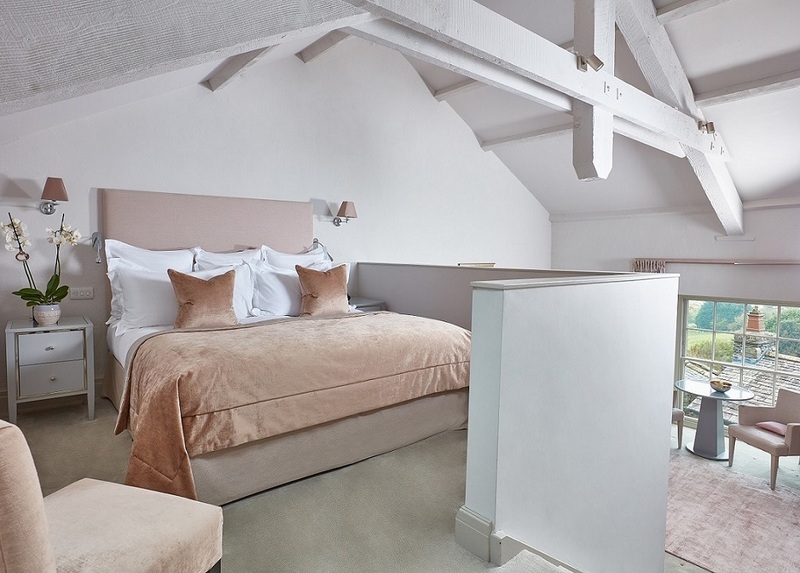 The top level, open to the original eaves and beams, embraces the bedroom with its super-king sized bed. 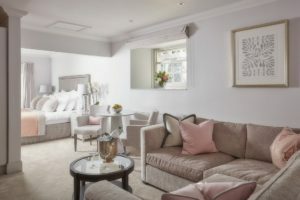 This suite can accommodate pets. 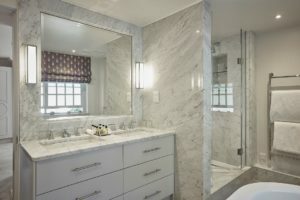 A split-level barn style suite; the bathroom is on the ground floor, clad in Carrara marble with a large bath and separate walk-in shower. 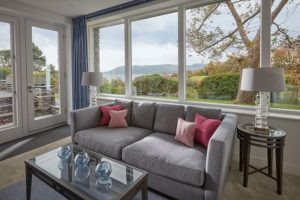 A few steps up is the sitting room, enjoying expansive lake views south over Windermere, and soothingly decorated in soft stone neutrals with accents of dove pink. 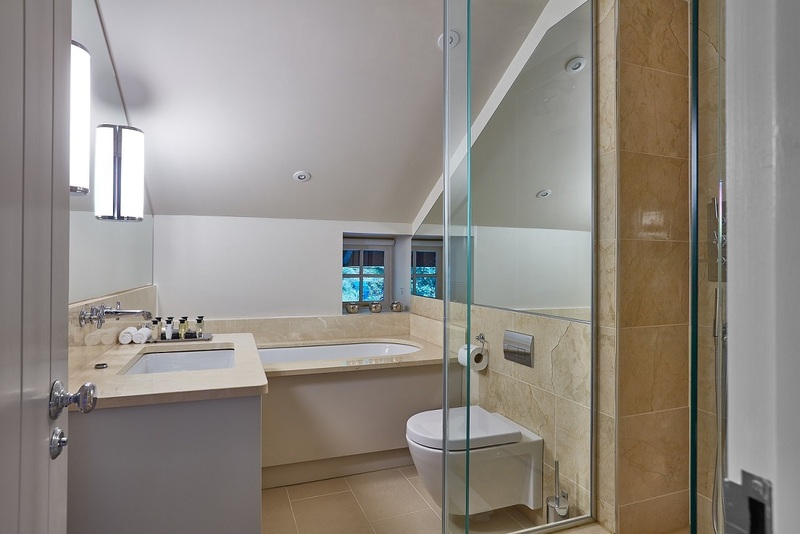 The top level, tucked under the eaves, houses the bedroom with its super-king sized bed. 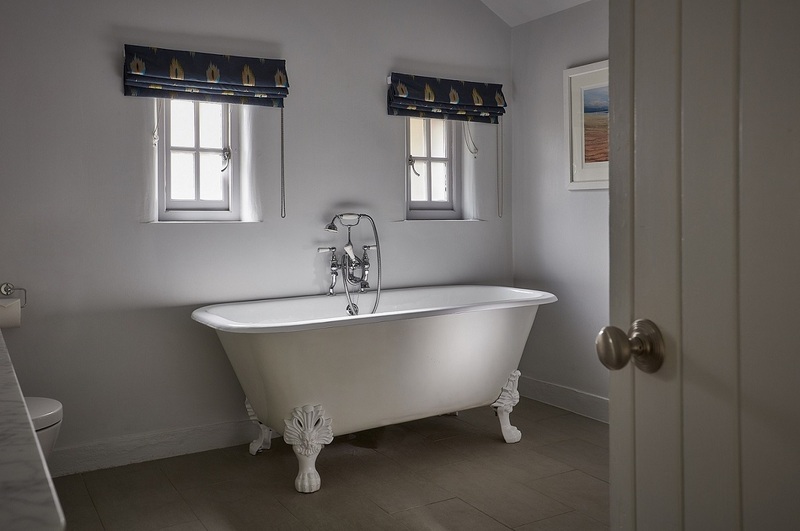 Is advantageously perched at the top of the estate, this large cottage is spread over two floors and has its own private patio overlooking the lake. 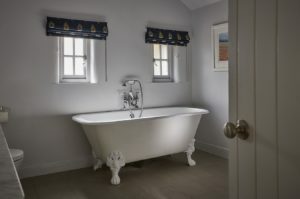 Entering via a large sitting room, a generous bay window with french doors leading to the patio provides an angled view south along the lake. A natural slate wall harmonises with the soft greeny blues of the furnishings. 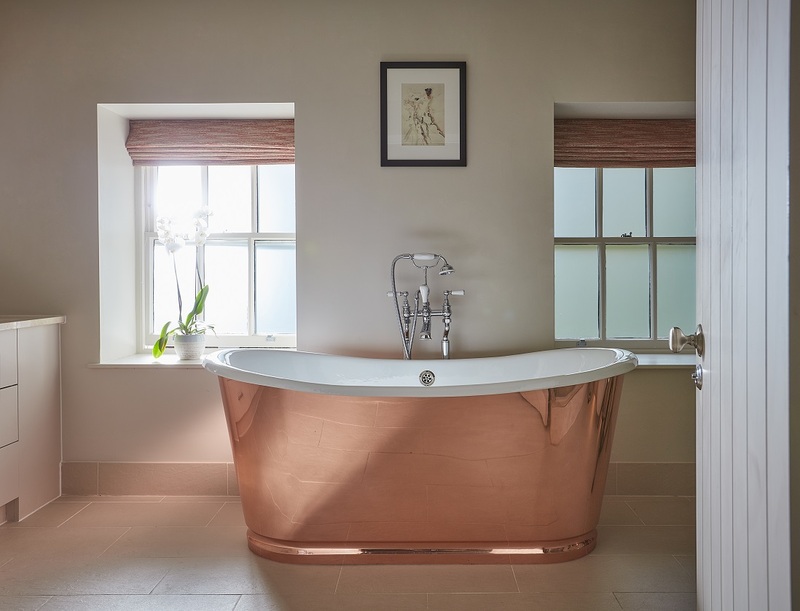 The bathroom leads off this level, featuring an elegant copper-clad freestanding bath, a double vanity unit, and a large walk-in shower. 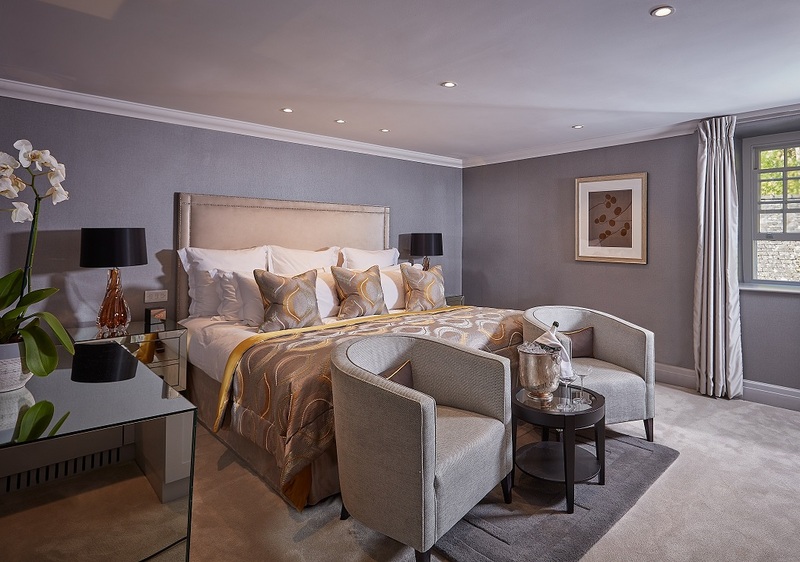 Wrought iron balustrading leads to the bedroom and defines the first floor – leaving it feeling spacious and airy, open to the double height space. 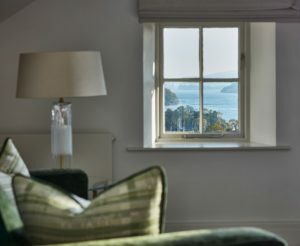 Sits adjacent to the main house, facing directly out over the gardens to fabulous lake views from large windows in all rooms. The sitting room is decorated in lavender and slate blues inspired directly by the views. 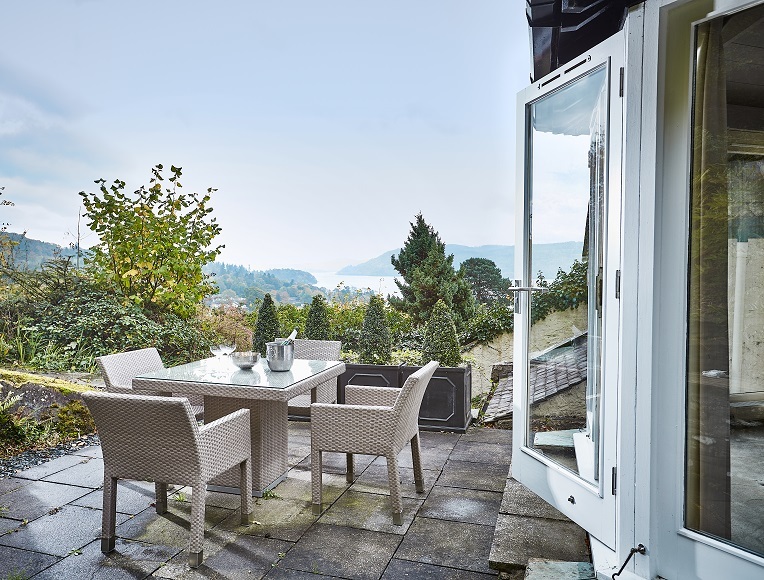 French doors lead from both bedroom and sitting room onto its private patio. 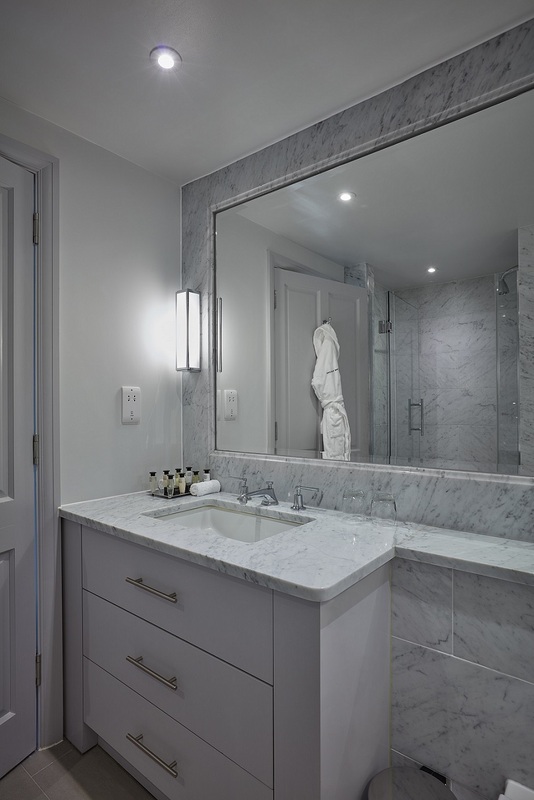 The bathroom is located midway between the two rooms, clad in Carrara marble with a traditional roll top bath, plus spacious walk-in shower and double vanity unit. The bedroom has a dream inducing emperor size bed and more lake views. Nestles in the eaves of the main house, stretching from front to back of the building with both lake and woodland views. 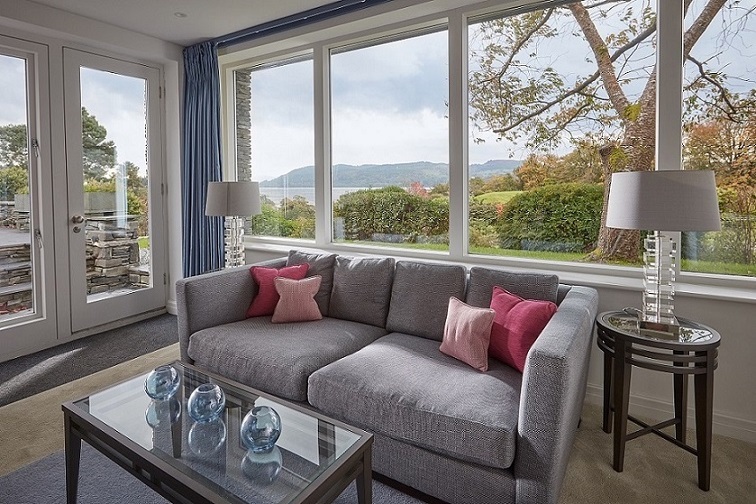 The sitting room at the front faces out over Windermere, skylight windows create a light filled room with the extra advantage of rooftop views over the lake towards Coniston Old Man. Its architecture is enhanced by creams and rich forest greens – as is the equally spacious bedroom with emperor size bed, overlooking the National trust woodland behind us. 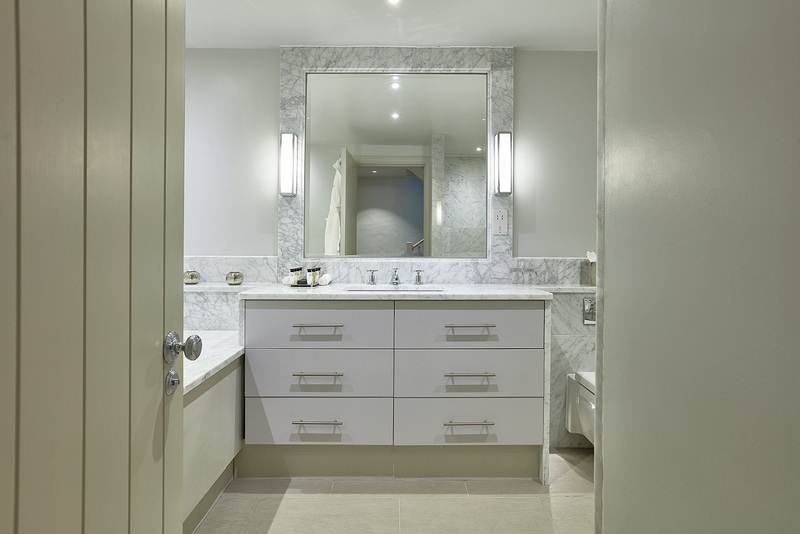 The ensuite bathroom provides a large marble dressed bath and separate walk-in shower. Has the cosy feel of a traditional lakes cottage; set over two floors with the sitting room on the ground floor enjoying dual aspect views from the garden and woodland behind us to south over the lake. 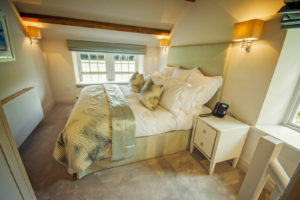 The bedroom and ensuite bathroom are upstairs, with a super king size bed well placed to enjoy the views out of the long low window. 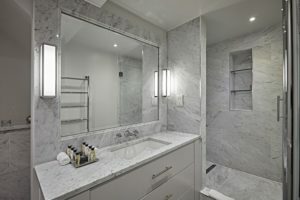 Watery tones of silver and sage greens enhance the feeling of serenity, whilst the Crema Marfil marble clad bathroom provides luxurious bathing. Has a prime position at the front of the main house enjoying our sweeping lake views over Windermere, Rydal Water is a firm favourite with many of our regular guests. 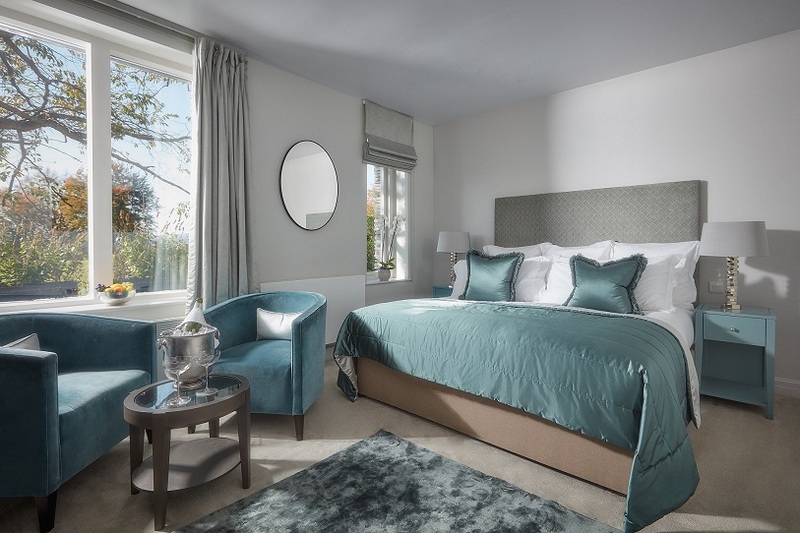 Decorated in soft silver and rich slate blue, the bedroom has an emperor size bed and separate dressing area which leads into a sumptuous Carrara marble bathroom. These have views over the beautiful woodland behind us. This bright, airy bedroom takes pride of place at the front of the main house, with three south-facing picture windows displaying spectacular views across England’s largest lake, Windermere. 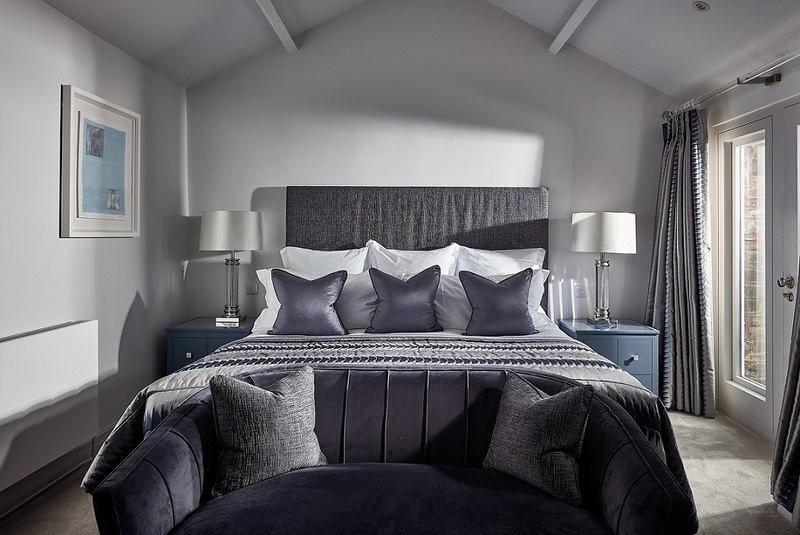 The room is decorated in complementary colours of soft lilac grey with hints of dramatic black and muted pinks. This generous room has an emperor size bed, and the sophisticated bathroom has a separate shower and marble clad bath. 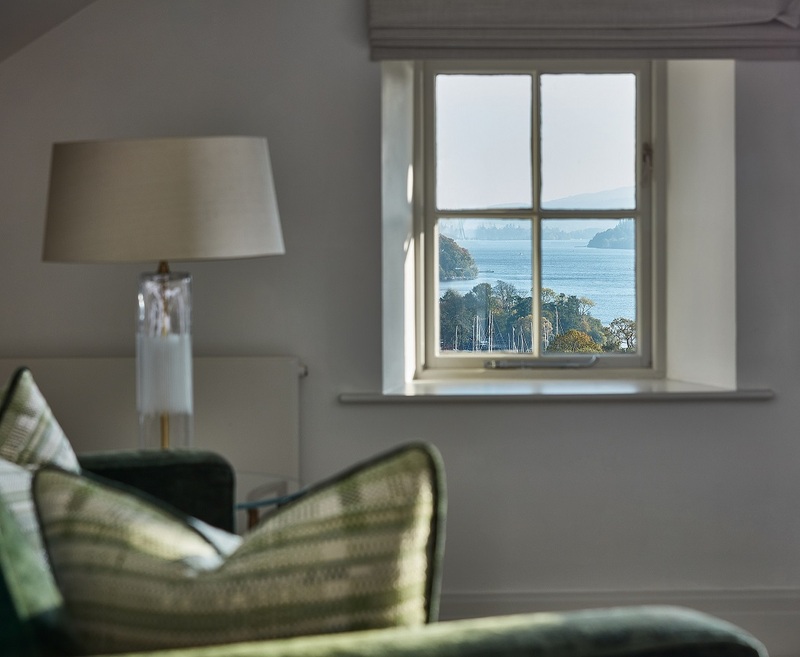 as with all the front facing rooms in the main house, enjoys lengthy lake views over Windermere, with the advantage of a second window looking west over the lake towards the Coniston mountains – providing a beguiling backdrop for this sumptuous room. 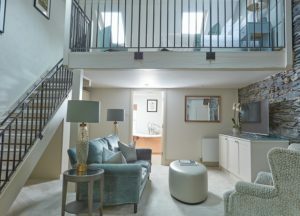 The seating area offers a large comfortable corner sofa. The bedroom is situated at the front of the house and boasts an emperor size bed, decorated in calming silvers, mauves and lilacs – the gentle twilight colours of sunset. The modern free standing bath gives a contemporary twist to the bathroom which also enjoys a double vanity unit and spacious shower. A strikingly glamorous room located at the rear of the house overlooking the gardens and private National Trust woodland behind us. Decorated in warm stone hues with bursts of lichen yellow and silver. The bedroom has an emperor size bed, adding to the feeling of cosseting luxury, enhanced by marble clad bathroom is with walk-in shower. Is ideally located at the front of the hotel in the same Lakeland stone building as Blea Tarn. Soothing tones of woodland green and a super-king size bed create a warm and welcoming atmosphere – its huge lake facing window frames the dramatic view over Windermere. 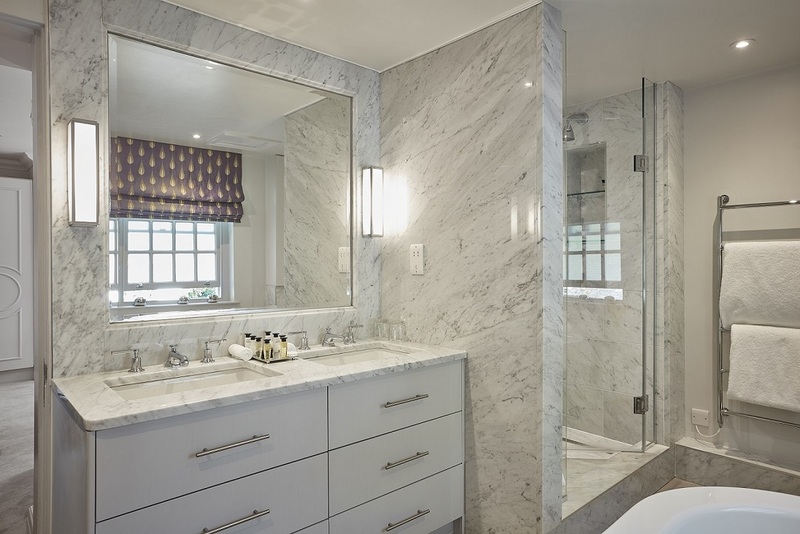 The marble clad bathroom offers a large walk in shower. 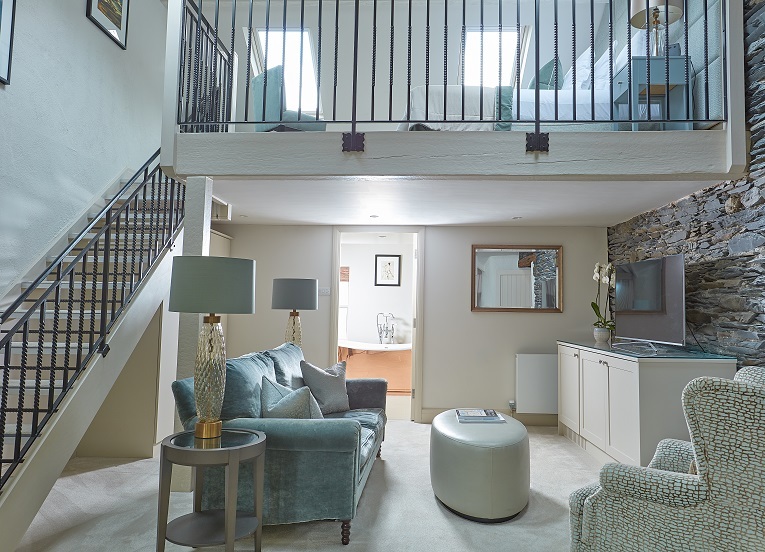 Buttermere can be booked individually or as an interconnecting 2 bedroom Suite with Blea Tarn. Rooms at The Samling provide: Bathrobes and slippers. 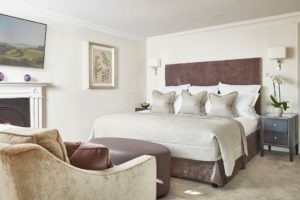 An evening turndown service. Goosedown pillows and duvets – hypoallergenic versions are available on request. Our own high quality 400 Thread Count bed-linen, (no laundry sharing with other hotels). Hairdryer. High speed wi-fi internet. 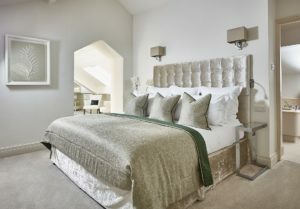 Hypnos wool and cashmere blend beds. In-room safe. Lalique toiletries. Marble bathrooms with underfloor heating. Mini bar. Room service. Smart TVs. Tea and coffee making facilities. Complimentary bottled water, fruit and snack.